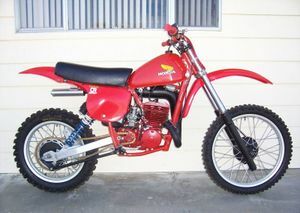 The CR250R'78 Elsinore was sold in 1978 in Tahitian Red. 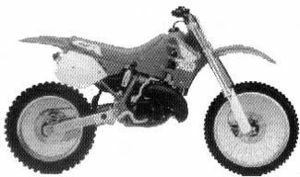 The "CR250R ELSINORE" decal was yellow, white, and blue. 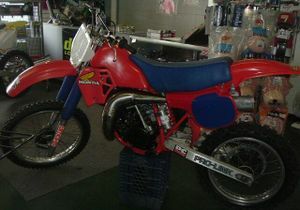 The bike had a single downtube frame and side port exhaust. The engine color was also red. The gas tank was aluminum. 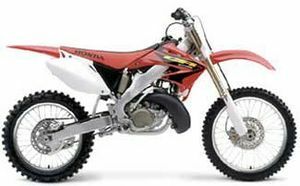 The engine was a 247cc 2-stroke reed valve single cylinder linked to a 5-speed transmission. 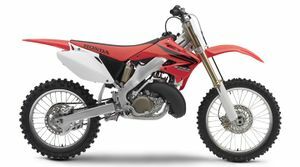 The serial number began CR250R-2000010. 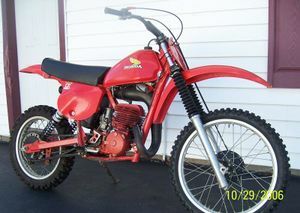 The CR250R'79 Elsinore was sold in 1979 in Tahitian Red. 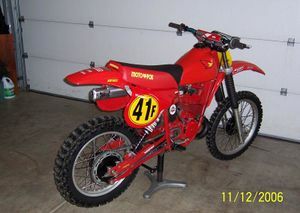 The "250R CR ELSINORE" decal was white, black, and yellow. It had a grid pattern reed calve. 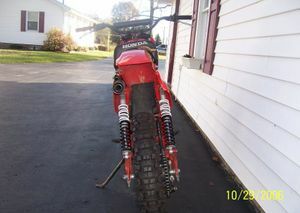 The bike had a single downtube frame and side port exhaust. The engine color was also red. The gas tank was aluminum. 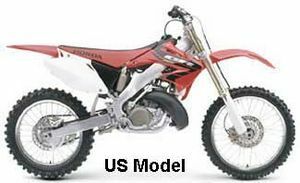 The engine was a 247cc 2-stroke reed valve single cylinder linked to a 5-speed transmission. 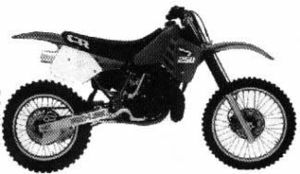 The serial number began CR250R-2100006. 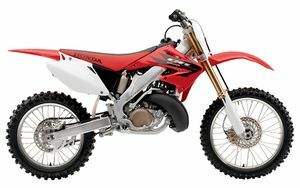 Cylinder with bridged intake port, Counter shaft sprocket cover mounted to frame, four-bolt front axle clamp, aluminum shift lever, "CR250R Elsinore" side panel decals in red, white and black, and L-shaped rear chain guide. 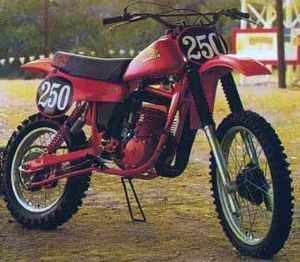 The CR250R'80 Elsinore was sold in 1980 in Tahitian Red. The seat was black with a red "CR" logo. The gas tank was plastic. The bike used FIM-type side number plates. 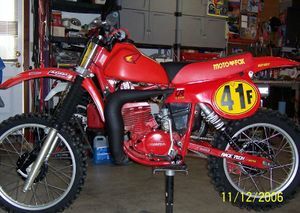 The frame was a double downtube and the exhaust was a center port. The engine color was also red. 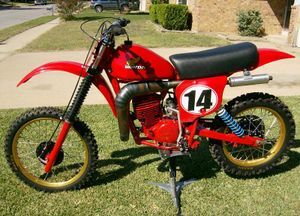 The engine was a 247cc 2-stroke reed valve single cylinder linked to a 5-speed transmission. The serial number began ME03-2001031. 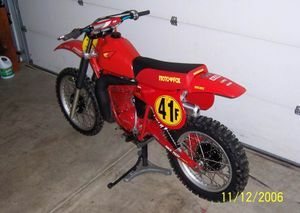 The CR250R'81 Elsinore was sold in 1981 in Tahitian Red. The tank shroud and number plate panels were white. 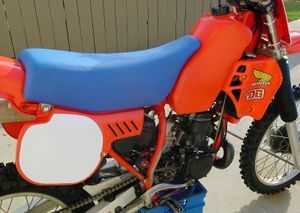 The seat was black with a white "250R" graphic. The front brakes were double leading shoe. The rear suspension was a Pro-Link. 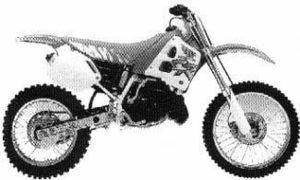 The engine was a 246cc 2-stroke liquid-cooled reed valve single cylinder linked to a 5-speed transmission. The gas tank was plastic. The bike used FIM-type side number plates. The serial number began JH2ME0303BC3000025. 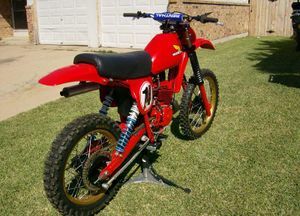 The CR250R'82 was sold in 1982 in Tahitian Red. The tank shroud was red while the number plate panels were white. 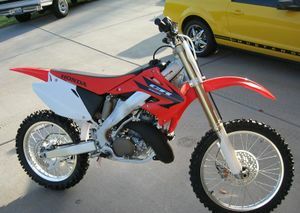 The fork boots were black and the white rims were silver. The engine was black. The rear wheels had drum brakes. 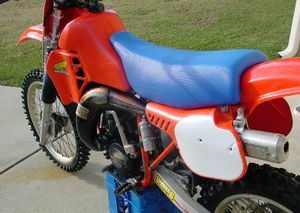 The seat was black with a white "250R" graphic. The front brakes were double leading shoe. The gas tank was plastic. The bike used FIM-type side number plates. The rear suspension was a Pro-Link. 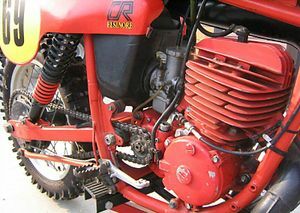 The engine was a 246cc 2-stroke liquid-cooled reed valve single cylinder linked to a 5-speed transmission. 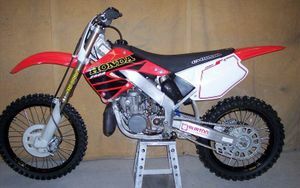 The serial number began JH2ME0300CC400021. 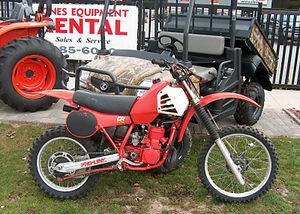 The CR250R'83 was sold in 1983 in Flash Red. The tank shroud was red while the number plate panels were white. 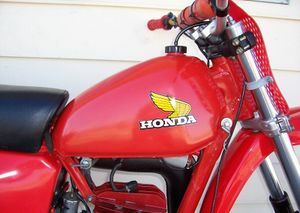 The "250R" swingarm decal was black. The seat was blue with a white "CR" graphic. 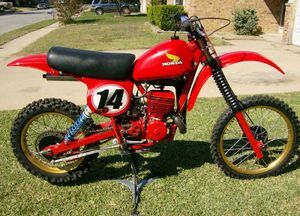 The bike had a left side kick starter arm. The Drive chain and sprocket was on the right side. The silencer was aluminum. The gas tank was plastic. 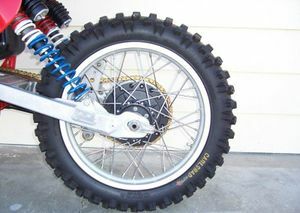 The fork boots were black and the white rims were silver. The front brakes were double leading shoe. The rear wheels had drum brakes. The bike used FIM-type side number plates. The engine was black. The rear suspension was a Pro-Link. 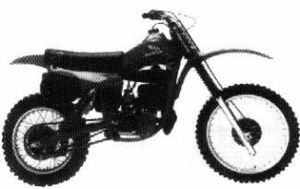 The engine was a 246cc 2-stroke liquid-cooled reed valve single cylinder linked to a 5-speed transmission. The serial number began JH2ME0301DC500030. 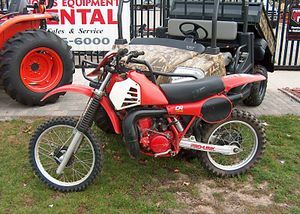 The CR250R'84 was sold in 1984 in Flash Red. The tank shroud was red while the number plate panels were white. The gas tank was plastic. The seat was blue with a white "CR" graphic. 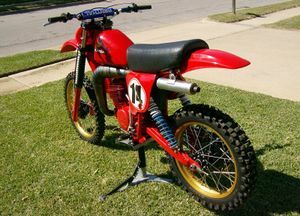 The fork boots were black and the wheel rims were silver. 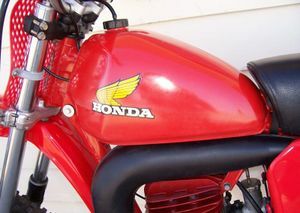 The "250R" swingarm decal was red and white. It featured an ATAC (Automatic Torque Amplification Chamber). The front brakes were hydraulic disc. The kick starter arm was on the right side. The drive chain and sprocket were on the left side. The bike used FIM-type side number plates. The rear wheels had drum brakes. The rear suspension was a Pro-Link. The engine was black. The silencer was aluminum. 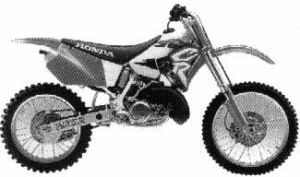 The engine was a 246cc 2-stroke liquid-cooled reed valve single cylinder linked to a 5-speed transmission. The serial number began JH2ME0304EC600001. 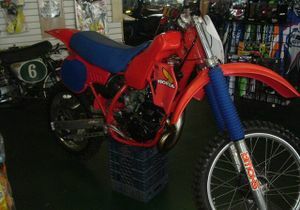 The CR250R'85 was sold in 1985 in Flash Red. The Honda wing decal was red, white, and blue. The "250" tank decal was red and blue. The fork boots were blue. Even the "PRO-LINK" swingarm decal was blue. The tank shroud was red while the number plate panels were white. The gas tank was plastic. The fork boots were black. The bike used FIM-type side number plates. The rear suspension was a Pro-Link. The seat was blue with a white "CR" graphic. The rear wheels had drum brakes. The engine was black. The silencer was aluminum. The front brakes were hydraulic disc. The kick starter arm was on the right side. The drive chain and sprocket were on the left side. It featured an ATAC (Automatic Torque Amplification Chamber). The fuel system had a 36mm flat-slide carburetor. 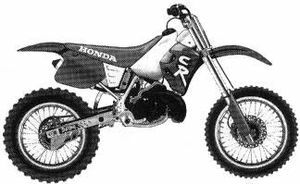 The engine was a 246cc 2-stroke liquid-cooled reed valve single cylinder linked to a 5-speed transmission. The serial number began JH2ME0309FC700001. 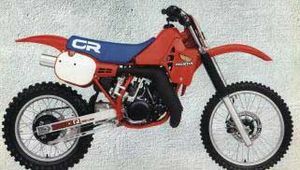 The CR250R'86 was sold in 1986 in Flash Red. The tank shroud was red while the number plate panels were white. The Honda wing decal was red, white, and blue. 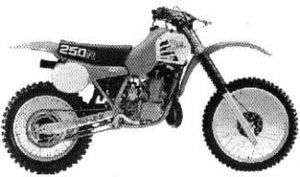 The "250" tank decal was red, outlined in white. The fork boots were blue. The gas tank was plastic. The seat was blue with a white "CR" graphic. The wheel rims were gold. The rear wheels had drum brakes. 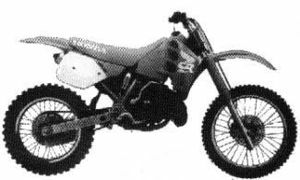 The "PRO-LINK" swingarm decal was a black outline. The bike used FIM-type side number plates. The front brakes were hydraulic disc. The kick starter arm was on the right side. The drive chain and sprocket were on the left side. The rear suspension was a Pro-Link. The silencer was aluminum. The fuel system had a 36mm flat-slide carburetor. The cylinder linings used Nikasil®. It also had Honda power port (HPP). The engine was black. 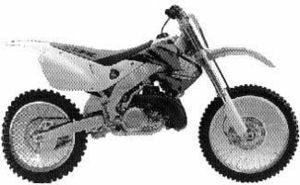 The engine was a 249cc 2-stroke liquid-cooled reed valve single cylinder linked to a 5-speed. The serial number began JH2ME0303GC800001. 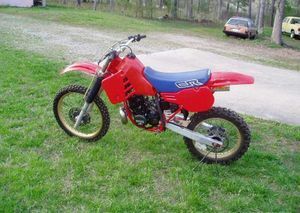 The CR250R'87 was sold in 1987 in Flash Red. The tank shroud was red while the number plate panels were white. The Honda wing decal was red, white, and blue. 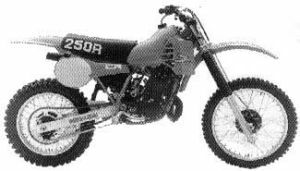 The "250" tank decal was white. The fork boots were blue. The gas tank was plastic. The seat was blue with a white "CR" graphic. The bike used FIM-type side number plates. The wheel rims were gold. The front brakes were hydraulic disc. The rear brake had a hydraulic disc. The kick starter arm was on the right side. The drive chain and sprocket were on the left side. The rear suspension was a Pro-Link. It also had Honda power port (HPP). The engine was black. The silencer was aluminum. 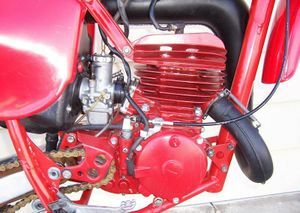 The fuel system used a 38mm flat-side carburetor. 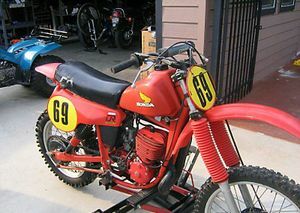 The engine was a 249cc 2-stroke liquid-cooled reed valve single cylinder linked to a 5-speed. The serial number began JH2ME0308HC900001. 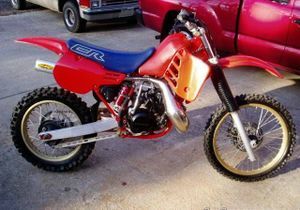 The CR250R'88 was sold in 1988 in Fighting Red. The tank shroud was red while the number plate panels were white. 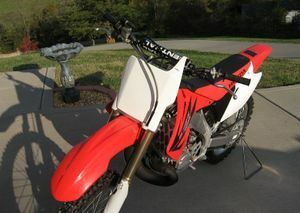 The wing and "CR250" tank decals were white. 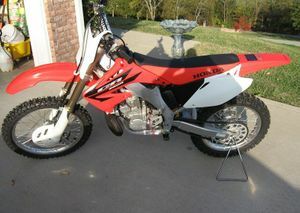 The seat was red with a white "HONDA" graphic. The fork boots were red. The wheel rims were silver. 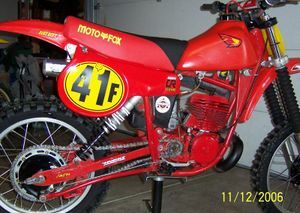 The "PRO-LINK" swingarm decal was a red outline. The gas tank was plastic. The front brakes were hydraulic disc. The kick starter arm was on the right side. The drive chain and sprocket were on the left side. The bike used FIM-type side number plates. The rear suspension was a Pro-Link. The silencer was aluminum. The front brakes were hydraulic disc. It also had Honda power port (HPP). The engine was black. 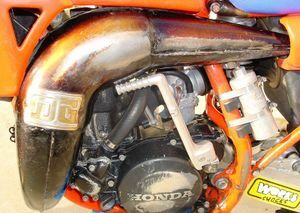 The fuel system used a 38mm flat-side carburetor. 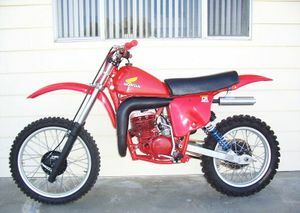 The engine was a 249cc 2-stroke liquid-cooled reed valve single cylinder linked to a 5-speed. The serial number began JH2ME0300JM000001. 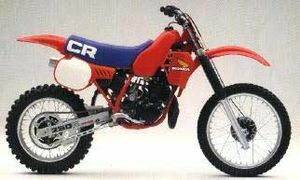 The CR250R'89 was sold in 1989 in Fighting Red. The tank shroud had a new style wing logo. The seat now had a "CR" on the seat. The forks used the inverted cartridge type. The drive chain and sprocket were on the left side. The rear suspension was a Pro-Link. The silencer was aluminum. It also had Honda power port (HPP). The fuel system used a 38mm flat-side carburetor. 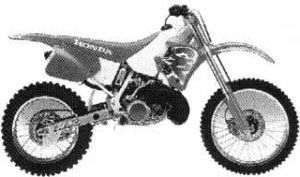 The engine was a 249cc 2-stroke liquid-cooled reed valve single cylinder linked to a 5-speed. The serial number began JH2ME030*KM100001. 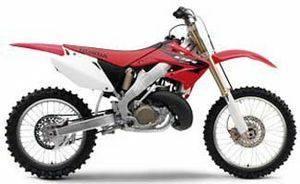 The CR250R'90 was sold in 1990 in Flash Red with Shasta White. The "CR" logo was blue with a white outline. The frame was Shasta White. The side panels and rear fender had an integrated look. The drive chain and sprocket were on the left side. The rear suspension was a Pro-Link. The silencer was aluminum. It also had Honda power port (HPP). The forks used the inverted cartridge type. The fuel system used a 38mm flat-side carburetor. The engine was a 249cc 2-stroke liquid-cooled reed valve single cylinder linked to a 5-speed. The serial number began JH2ME030*LM200013. The CR250R'91 was sold in 1991 in Flash Red with Ross White. 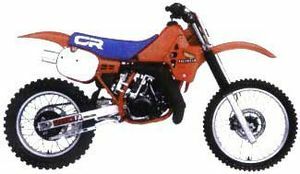 The "CR" logo was white, yellow, and orange. The side panels and rear fender had an integrated look. The seat graphics were white. The drive chain and sprocket were on the left side. 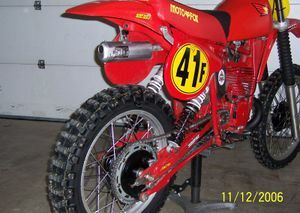 The rear suspension was a Pro-Link; the "250R" swingarm graphics were red. The frame was Ross White. The silencer was aluminum. It also had Honda power port (HPP). The forks used the inverted cartridge type. 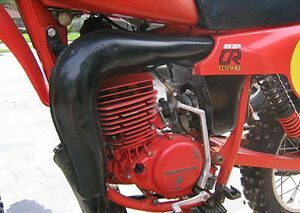 The fuel system used a 38mm flat-side carburetor. 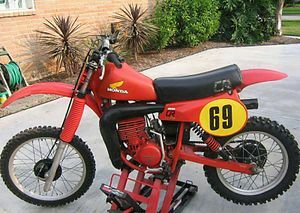 The engine was a 249cc 2-stroke liquid-cooled reed valve single cylinder linked to a 5-speed. The serial number began JH2ME030*MM300005. 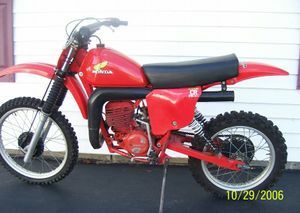 The CR250R'92 was sold in 1992 in Nuclear Red with Shasta White. 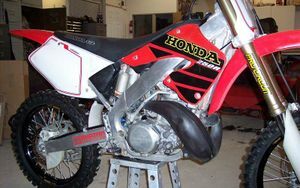 The gas tank and airbox cover were white. The "CR" logo was white with a blue outline. The side panels and rear fender had an integrated look. The drive chain and sprocket were on the left side. The rear suspension was a Pro-Link. The silencer was aluminum. It also had Honda power port (HPP). The frame was Ross White. The forks used the inverted cartridge type. 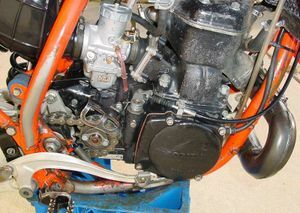 The fuel system used a 38mm flat-side carburetor. The engine was a 249cc 2-stroke liquid-cooled reed valve single cylinder linked to a 5-speed. The serial number began JH2ME030*NM400009. 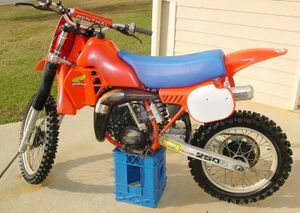 The CR250R'93 was sold in 1993 in Nuclear Red with Shasta White. The "CR" logo was blue with a white outline. The frame was chalk white. The red color was a deeper red. The side panels and rear fender had an integrated look. The drive chain and sprocket were on the left side. The rear suspension was a Pro-Link. The silencer was aluminum. It also had Honda power port (HPP). The forks used the inverted cartridge type. The fuel system used a 38mm flat-side carburetor. 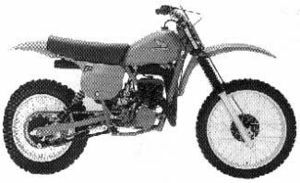 The engine was a 249cc 2-stroke liquid-cooled reed valve single cylinder linked to a 5-speed. The serial number began JH2ME030*PM500001. 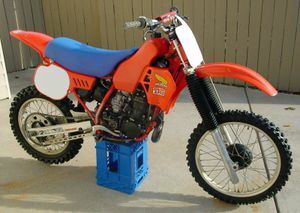 The CR250R'94 was sold in 1994 in Nuclear Red with Shasta White. The "CR" logo was fluorescent yellow with a purple outline on a red background. The drive chain and sprocket were on the left side. The rear suspension was a Pro-Link. The silencer was aluminum. It also had Honda power port (HPP). The fuel system used a 38mm flat-side carburetor. The engine was a 249cc 2-stroke liquid-cooled reed valve single cylinder linked to a 5-speed. 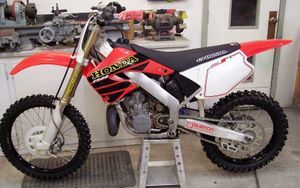 The serial number began JH2ME030*RM600010. 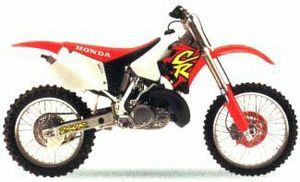 The CR250R'95 was sold in 1995 in Nuclear Red with Shasta White. The "CR" logo was redesigned fluorescent yellow with a red outline on a purple background. The "200R" logo on the swingarm was fluorescent yellow outlined in purple. The seat was blue with "HONDA" in white. The drive chain and sprocket were on the left side. The rear suspension was a Pro-Link. The silencer was aluminum. It also had Honda power port (HPP). The fuel system used a 38mm flat-side carburetor. 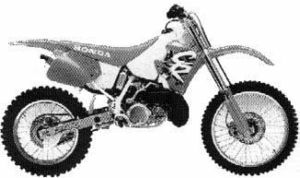 The engine was a 249cc 2-stroke liquid-cooled reed valve single cylinder linked to a 5-speed. 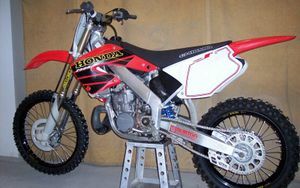 The serial number began JH2ME030*RM600010. 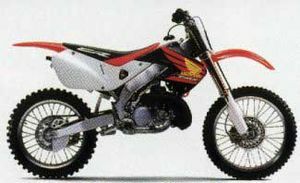 The CR250R'96 was sold in 1996 in Nuclear Red with Shasta White and Black. 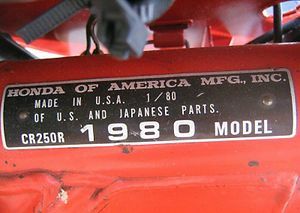 The logo had a distinctive Team Honda red, white, and black colors. The drive chain and sprocket were on the left side. The rear suspension was a Pro-Link. There was an all-new larger 46mm Kayaba cartridge front fork. The silencer was aluminum. It also had Honda power port (HPP). 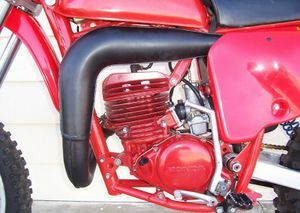 The fuel system used a 38mm flat-side carburetor. 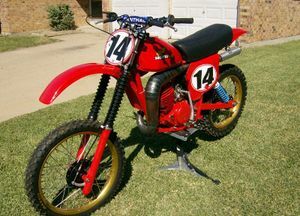 The engine was a 249cc 2-stroke liquid-cooled reed valve single cylinder linked to a 5-speed. The serial number began JKH2ME030*SM700007. Rear suspension: Pro-Link Showa single-shock with spring-preload, 13-position (low- speed) and 3.5-turn (high-speed) compression-damping and 17-position rebound-damping adjustability; 320mm (12.6 in.) travel. This page was last edited on 28 November 2010, at 21:02.